Tile and Grout Cleaning ServiceMaster by PWF. Trusted & Dependable. tile and grout as well! Nowadays, most modern homes and businesses consist of more than just upholstered furniture and carpeting. In fact, tile and other hard surfaces are becoming increasingly commonplace. The ServiceMaster Clean tile cleaning process is thorough and complete! We extract the dirt from your tile floors, removing it from deep within the pores of the grout. In next to no time, we clean and restore your tiles to their modern, refreshed look. In doing so, we eliminate the expense that comes with total replacement. For your business or commercial industrial warehouse, naturally it’s not hard to believe that traffic can be heavy at certain times during the day in your commercial workplace, and lots of different feet track dirt and grime from lots of different places. That’s a lot of possibility for soiling your tile and grout. Therefore, we use only the most efficient equipment. First, we inspect your floors to determine the best treatment process. Then our trained technicians use high-pressure jets, combined with truck-mounted steam/pressure cleaning to clean your tile and grout. In other words, we use a water and vacuum combination that suctions the dirt from deep within the tile. This is similar to our outdoor high power pressure washing method, the difference being the vacuum, which prevents a watery mess in enclosed spaces. The entire process only takes between 30-60 minutes for an average-sized room. Places of business with larger tiled areas should allow for additional cleaning time. Of course, the time spent cleaning will also depend on other factors, like the size of the tile, amount of soil in the grout lines, and room configuration. Regardless of the type of disaster that strikes your home or office, the last part of the restoration process is going to be cleaning your floors. ServiceMaster by PWF has the team of professionals to determine the type of damage done to your floor and just the right process to get it clean, disinfected, and looking like brand new. Some homeowners and business owners might think that cleaning their tile and grout after a disaster is the one part of the restoration they can handle themselves, but this restoration cleaning isn’t like that weekly cleaning you do. 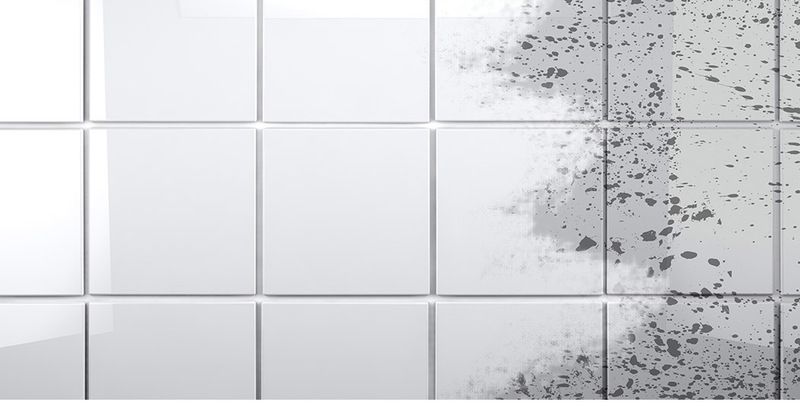 Fire – Cleaning your tile after a fire can add several cleaning complications. Depending on how the fire was put out, you may have chemicals to clean up, or you may have water damage. ServiceMaster Restoration by PWF will work with you to assess whether your tiles themselves have been damaged by either the heat or the water. Once they have determined that your tiles are salvageable, they also determine the best way to clean your tile and grout. If chemicals were used to put out the fire, we take special care to ensure that the chemicals are disposed of safely without contaminating either the rest of your building or the environment. Once the chemicals are safely removed, dry vacuuming of the soot is followed by cleaning and then drying.If either the fire or the chemicals damaged the seal on either the tile or grout, resealing may be necessary after the tile and grout are completely clean and dried. One of the keys to success is allowing the necessary time for the tile and grout to completely dry. Resealing before everything is completely dry will only result in more damage down the road. If water was used to put out the fire, you will end up with the same issues as if you had grey or black water damage, so the steps for cleaning them are the same. Water or flood – The cleanup after water damage can raise some difficult issues. First, the type of water must be determined and removed safely. Once ServiceMaster by PWF has removed the water, they will then assess the damage. If the water has been standing for a while, the tile must be dried before cleaning can begin. Attempting to clean the tile before drying out the tile may result in more damage. Once your tile is thoroughly dried, cleaning, drying and resealing will leave it looking like new. Cleaning your Tile and Grout does not necessarily have to be done because of a disaster. Sometimes, our clients just want the grout to look clean and the tile to look fresh. This may be on a back splash or floor in a home, restaurant, hospital, or any business. We have the team of professionals that recognize that not all floors can withstand or require the same type of cleaning service. But in the end, the result is what everyone is looking for. Clean fresh tile and grout. If you are looking for clean and fresh sparkling tile and grout, we are the company to call. Our quality service technicians in Alachua, Columbia, Dixie, Lafayette, Levy, Marion, Gilchrist, Bradford, Union, Clay, Duval, St. John, and Pinellas Countieslook forward to serving you. Call today for a free quote!